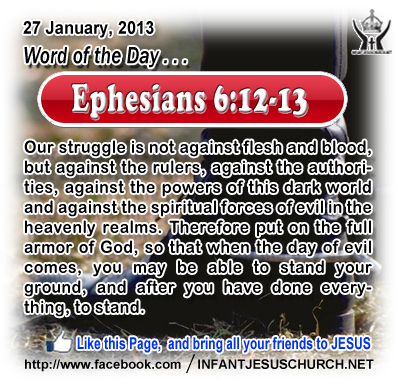 Ephesians 6:12-13: Our struggle is not against flesh and blood, but against the rulers, against the authorities, against the powers of this dark world and against the spiritual forces of evil in the heavenly realms. Therefore put on the full armor of God, so that when the day of evil comes, you may be able to stand your ground, and after you have done everything, to stand. Heavenly Father, protect us from the evil one by your great power. Give us a sense of urgency as we face Satan and his schemes on a daily basis, but also give us confidence that Jesus has already defeated our foe. Help us to stand against this foe and show myself faithful to you. Through Infant Jesus our Lord and Savior we pray. Amen. 1-1Inasmuch as many have undertaken to compile a narrative of the things which have been accomplished among us, 2just as they were delivered to us by those who from the beginning were eyewitnesses and ministers of the word, 3it seemed good to me also, having followed all things closely for some time past, to write an orderly account for you, most excellent The-oph'ilus, 4that you may know the truth concerning the things of which you have been informed.4-14And Jesus returned in the power of the Spirit into Galilee, and a report concerning him went out through all the surrounding country. 15And he taught in their synagogues, being glorified by all. 16And he came to Nazareth, where he had been brought up; and he went to the synagogue, as his custom was, on the Sabbath day. And he stood up to read; 17and there was given to him the book of the prophet Isaiah. He opened the book and found the place where it was written, 18"The Spirit of the Lord is upon me, because he has anointed me to preach good news to the poor. He has sent me to proclaim release to the captives and recovering of sight to the blind, to set at liberty those who are oppressed, 19to proclaim the acceptable year of the Lord." 20And he closed the book, and gave it back to the attendant, and sat down; and the eyes of all in the synagogue were fixed on him. 21 Then he began to say to them, "Today this scripture has been fulfilled in your hearing." 22 All spoke well of him and were amazed at the gracious words that came from his mouth. They said, "Is not this Joseph's son?" Jesus came this earth for our sake and for our salvation. He came to set us free from the most terrible oppression possible slavery to sin and the fear of death, and the eternal destruction of both body and soul. God's power only can save us from hopelessness, fear, spiritual emptiness, and despair. The gospel of salvation is Good-news for us today. This story is completely believable because it comes from reliable firsthand witnesses who knew Jesus personally, heard his teaching, saw his miracles, and spectators his death, resurrection, and ascension to the right hand of the Father in heaven. The word “Gospel" accurately means Good-news. The gospel is the good news of Jesus Christ and the liberty he has won for us through his death and resurrection. The gospel is God's word for us today! It's is a living word that has power to alter and transform lives, and bring freedom and curative to those who receive it as the word of God. Do you want to be changed and distorted by God's living word? Listen to his Son and receive his word with hopeful faith and trust. Loving Infant Jesus, you are the fulfillment of all our hopes and dreams. Through the contribution of your Holy Spirit you bring us truth, life, and freedom. Fill us with the joy of the gospel and inflame our heart with a burning love for you and a deep thirst for your word.